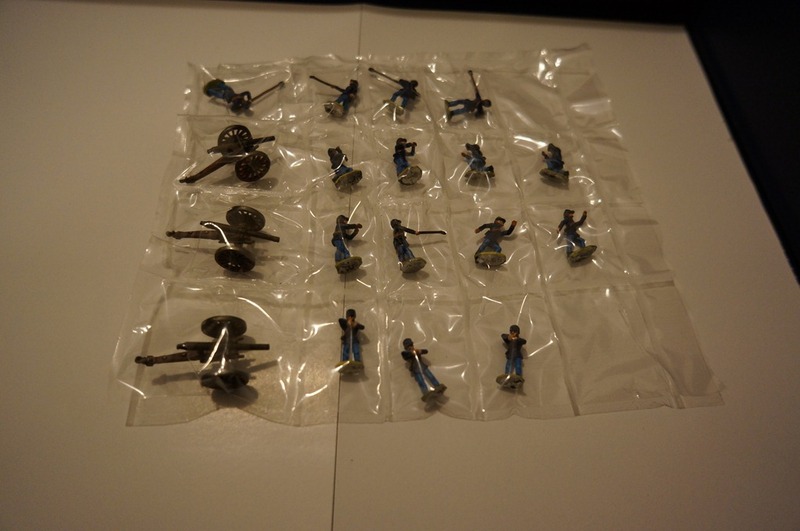 I had some American Civil War figures in 15mm scale from four manufacturers. OK, I had a lot of figures – both sides. Around 400 or so Union Infantry and about the same in Confederates. I was collecting them to paint about 10 years ago and have managed to leave them in the lead pile since then. I carried them from England to Korea to Australia and then lastly on to Singapore. “Are you going to get round to painting them Thomo”, inquired Anthony. “Yes, no, maybe”, was the reply. I looked for a painting service. I have had figures painted in the past – usually by the children of Tony Barr of East Riding Miniatures. I wanted something local and preferably not too expensive. I sparked up Google on the laptop and started searching. There are a surprising number of companies painting figures now and based in Asia. Several companies in Sri Lanka, Thailand, the Philippines, China (well, Hong Kong SAR and China really) and Bangladesh. I have even tracked one down in Africa. All have pricing near to each other and offer figures painted to a number of levels. All seem to offer ethical working conditions for their employees as well. I settled on Miniature Lanka for the first batch of ACW Union figures. I had a ten year old Minifigs Union Army so shipped that off to see what sort of paint job Miniature Lanka would do before committing the rest of the figures. I thought, if they can do a reasonable job on the Minifigs, then the Old Glory 15s and Essex Miniatures should come up a treat as well as the Lancashire Games. They did a good job. I settled for collectors standard (they will paint basic wargames standard, collectors standard and museum standard). Best was once the figures were painted, digital photos were sent for my approval then the figures were packed up and sent to me. The packing was brilliant with no paint chipping or bent flagpoles, muskets or bayonets. The photo at the top shows how each of the figures is sealed into its own little pocket in clear plastic. 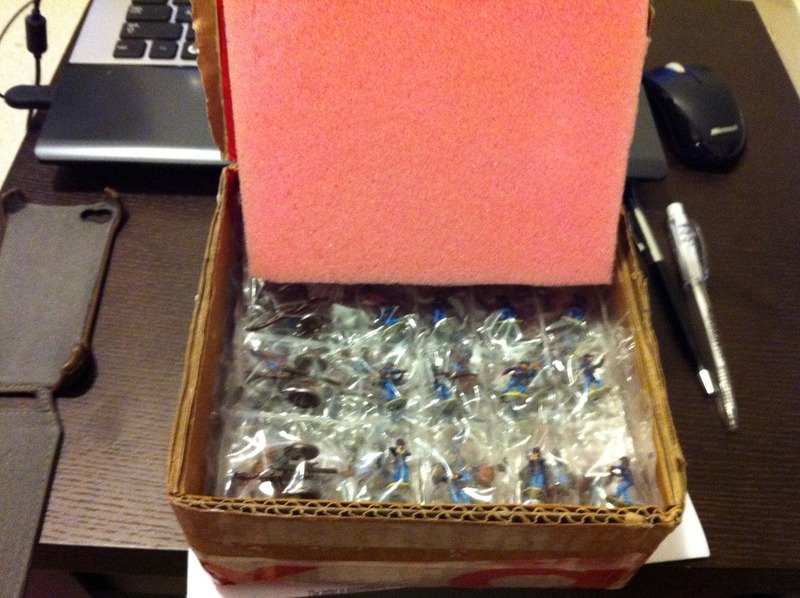 The sheets of figures are then laid on top of each other in the box and sent back to the customer. 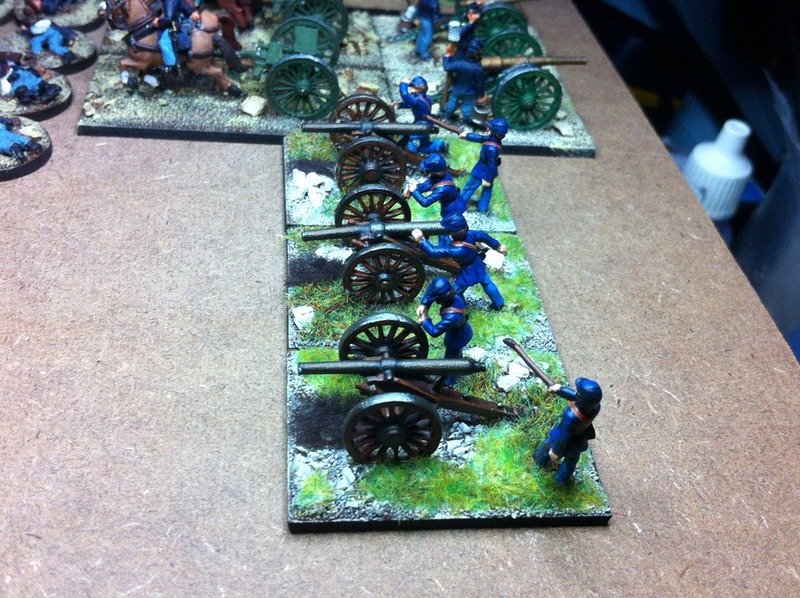 The photo to the left is the completed artillery from Miniature Lanka with my basing. I will get around to taking some better photos later. They look fantastic, especially like the very rich depth of colour they have. I'll try and do some decent photos this trip under decent(ish) light – but I am happy with the way they turned out and am looking forward to the mother of all basing jobs in about a month's time. Considering the next big painting effort too – whilst I enjoy the painting, I decided that I really should reduce the older parts of the lead pile (will that reduce my lifespan?). Thank you very much for your beautiful topic. I am trying to contact Mr Priyantha since oe month with no success . Do you have any fresh news from Him. ? Do you have any fresh news abt Priyantha. I am trying to contact him with no success…. I have not had any news – I’ll try giving him a call and see if he is OK. Check back in a day or so. I received an email response from him yesterday – they are still painting. Thanks for your answer, I am sending him lots of mail with no return answer. Do you have their correct phone number ? I’ve also passed your email address on to him in case you are ending up in his SPAM folder. Thanks for your kind help, I am also trying to reach him by phone, but number result incorrect.